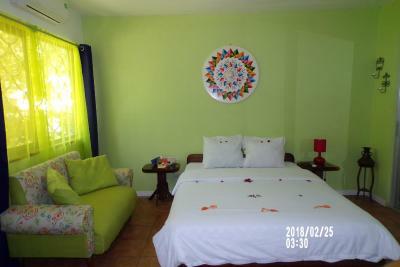 Lock in a great price for MyCasa's B&B – rated 9.2 by recent guests! By far our favorite place we stayed at in Costa Rica. Carlos and his family (including Kai and Maui the dogs and Cleo the kitten) were so warm and welcoming. Carlos went above and beyond throughout our stay and was happy and excited to give us suggestions for really amazing activities to do in Quepos. They have snorkel gear for rent which made for some incredible wildlife spots (sea turtles)! 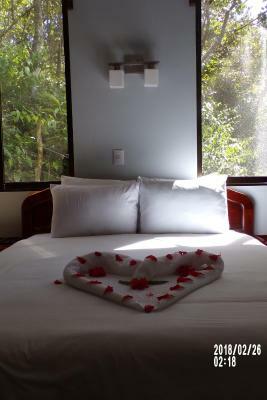 Our room was comfortable and air conditioned, the pool was perfect to cool off in and we saw more animals at MyCasa (monkeys, toucans, a very curious sloth, macaws and more) than we did at Manuel Antonio. Thank you for a wonderful stay! The owner was super friendly and helpful for setting up excursions. Breakfast was excellent and the pool was perfect for cooling off after Manuel Antonio! 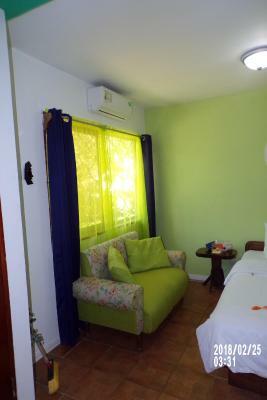 Clean and comfy room, most comfortable bed we found in 2 week trip to CR. 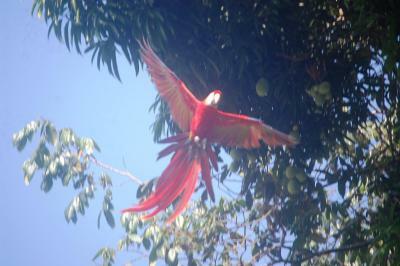 Fabulous breakfast on beautiful terrace with scarlet macaws and toucans flying around. 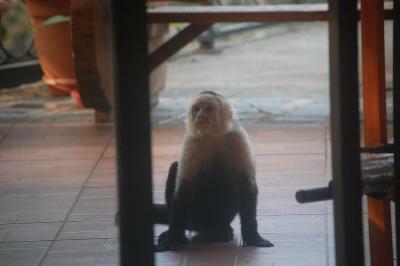 Monkeys visited in the evening. Fabulous experience. 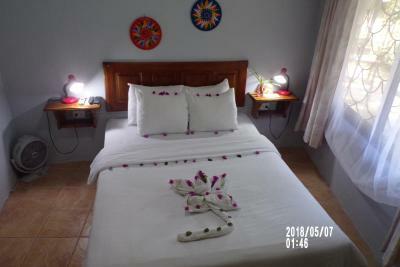 Carlos is an enthusiastic and very knowledgeable host, speaks excellent english. Nice pool for afternoon lounging, fridge in room, good AC We walked down to main road and caught the local bus to Manuel Antonio Park, very easy to do, cheap, and you don't have to mess with driving narrow roads and parking. Be sure to hit the falafel place in MA. Friendly and breakfast were great! Staff were always helpful and interactive. The property is beautiful. We saw animals right on the property. The host was really friendly and gave us lots of tips for enjoying our visit to the area. 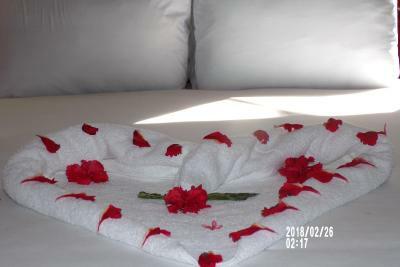 Breakfast was great, room was perfect, even petals on the bed! Gated facility so parking was safe. Pool was great for an afternoon swim on a hot day. Highly recommend! Carlos and his wife and daughter make this an AMAZING place to stay. 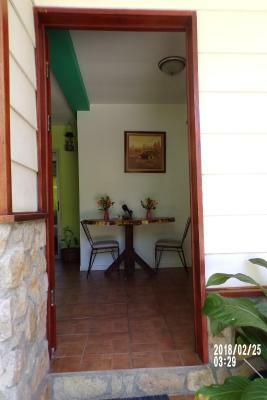 They are so incredibly inviting and friendly to their home, it feels as if you are staying with friends! 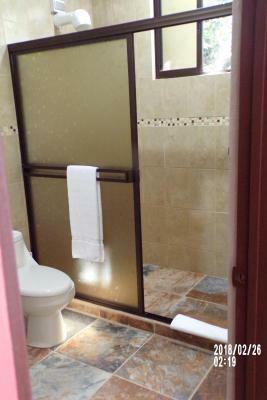 The room was super comfortable, the bathroom big, and there's even a mini fridge, microwave, and tv. The pool is also refreshing after a long day. 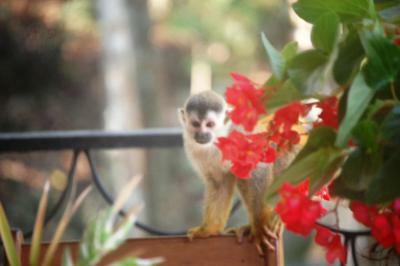 The location is also really close to both Quepos and Manuel Antonio. They made me an excellent vegan breakfast alternative. Carlos was also extremely helpful with tips and tricks for accessing the park and storing my bags when I checked out and went exploring. I HIGHLY RECOMMEND staying here. Carlos was an amazing host. The breakfast was awesome and the room was great! 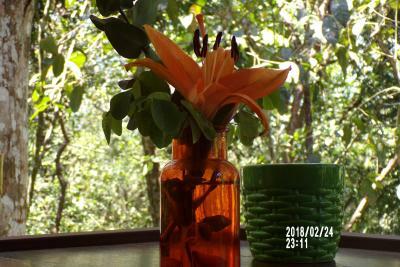 He gave us some great recommendations for our time in Manuel Antonio such as a secluded beach, great food and the best way to get into the national park. Would highly recommend and would definitely stay again! 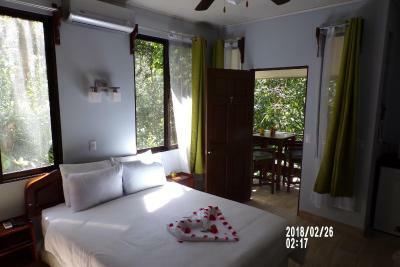 The room was very comfortable and it was lovely having breakfast on the terrace.If you’re in Quespos to visit Nacional ParqueManuel Antonio, the location is perfect. Quaint, family owned B&B. 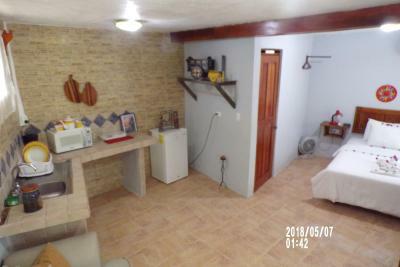 I liked the location as it’s out of Quepos, and closer to MA and the beaches. 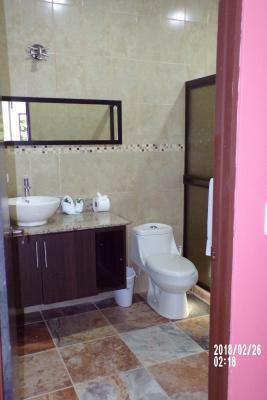 The owner is super nice, available and willing to give advise about the area. Breakfast was different every morning. The room was cleaned well daily. 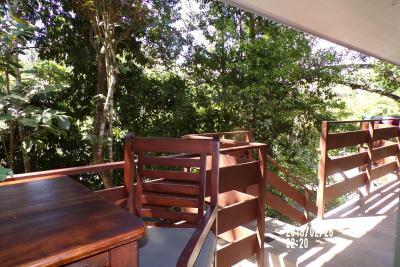 We stayed in the tree house which is only a few years old so everything looked nice. There is a lot of wild life on the property. We saw and heard a ton of macaws, there is a resident sloth which we got awesome views of one morning, and a whole troop of about a dozen squirrel monkeys came through one day during breakfast. They also stopped by the tree house which was really cool as they aren’t very shy creatures. 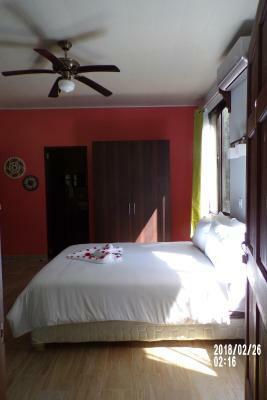 One of our best sellers in Manuel Antonio! 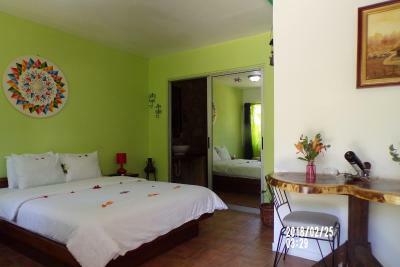 Offering an outdoor pool and a garden, MyCasa's B&B is located in Manuel Antonio. It offers free WiFi throughout. Juan Santamaría International Airport is 71 mi away. 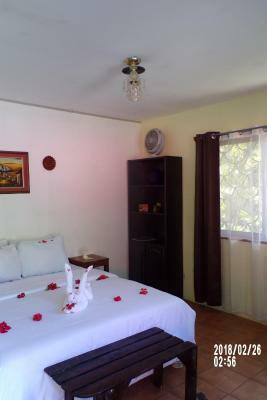 Air conditioning, a private entrance and a patio with garden view are featured in the rooms at MyCasa bed and breakfast. 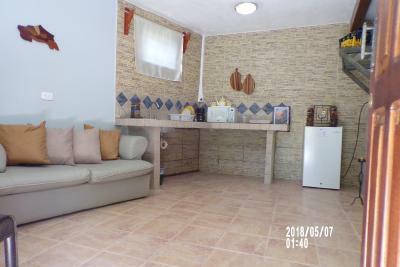 There is also a seating area with a sofa. 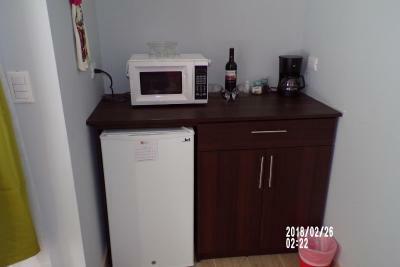 Guests can use a refrigerator and microwave. 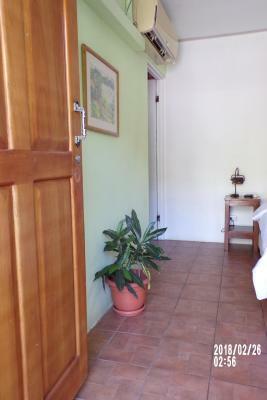 A 24-hour front desk and luggage storage are provided at this B&B. 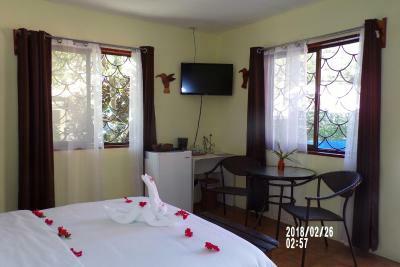 Guests will also find a shared lounge, a terrace and a barbecue. Daily maid service is included. 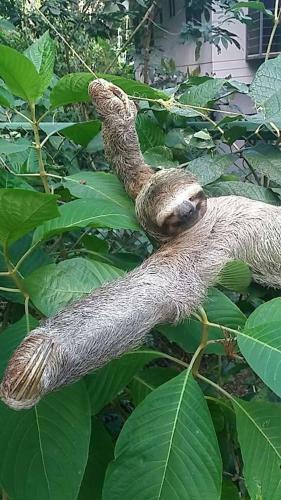 MyCasa’s B&B is 7 minutes’ drive from Manuel Antonio National Park and less than 15 minutes’ walk from Manuel Antonio Spanish School. Playitas Beach is 8 minutes’ drive away. 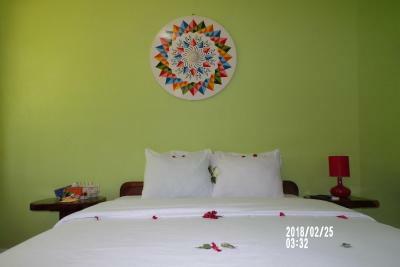 When would you like to stay at MyCasa's B&B? 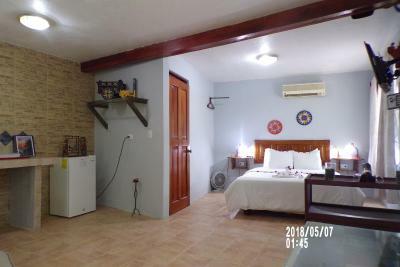 This double room features air conditioning and a patio with garden view. There is also a seating area. 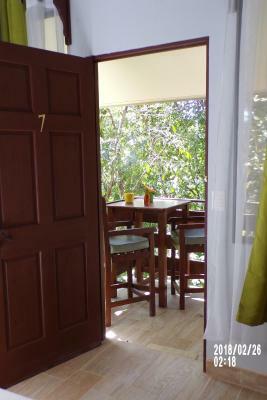 This suite features a dining area and view. House Rules MyCasa's B&B takes special requests – add in the next step! MyCasa&#39;s B&amp;B accepts these cards and reserves the right to temporarily hold an amount prior to arrival. MyCasa's B&B accepts these cards and reserves the right to temporarily hold an amount prior to arrival. Good breakfast with plates of assorted fruits. Then eggs served Costa Rica style. Freshly squeezed fruit juice and Coffee or Tea. The owner and family were friendly. 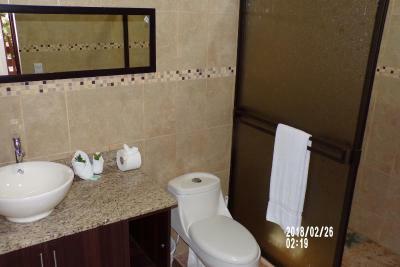 The owner offered advice on places to dine and places to see. 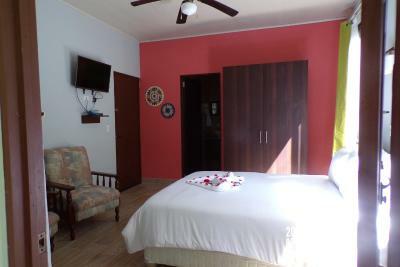 The rooms were well equipped as a home away from home and very comfortable. 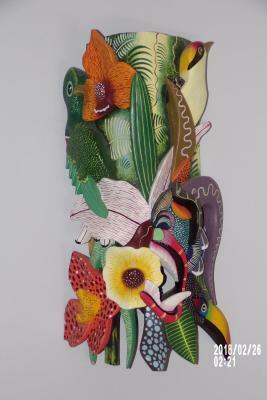 The tropical setting fro breakfast to view the colorful birds fly by, the sloth in a tree and an iguana . 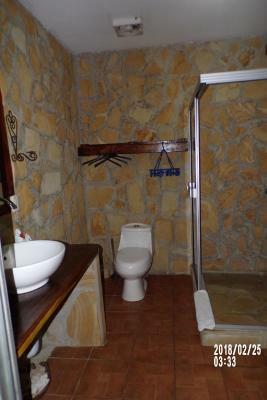 The place was clean and had a swimming pool. The property was gated and safe. 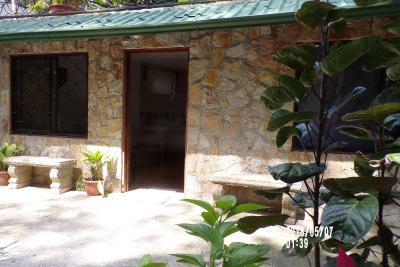 Close to Manuel Antonio National park and Beach. Loved everything about it. Location is gated so make sure to call ahead about how to enter. Not a big deal once you know how to get in. Carlos and his family are genuinely friendly and welcoming people. 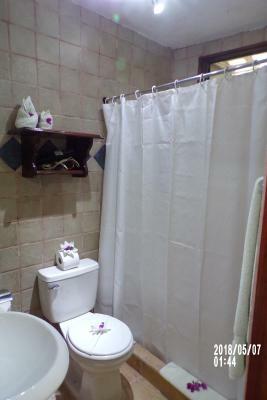 They will make you feel at home and give you great tips as far as where to go and what to avoid. Any questions I had, I felt confident in asking. Carlos genuinely loves taking care of his hosts and it shows. Check in was straightforward but recommend calling ahead to get parking instructions. Parking is on site but since it's gated, you will need to call to see about opening the electronic gate. The room was great! 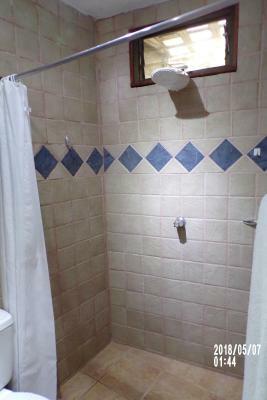 Cold AC unit, TV, hot shower and working toilet! 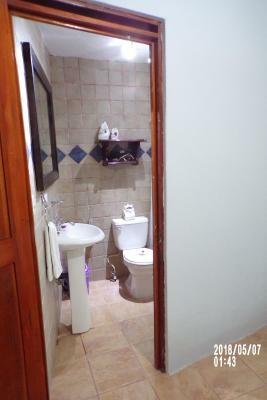 No problems with the room whatsoever. Breakfast was great! 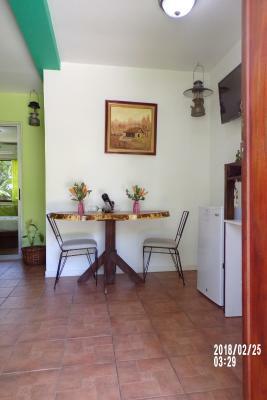 They will give you the option to take breakfast to go if you're planning on going to Manuel Antonio park. Will definitely recommend taking this option since the park does get EXTREMELY packed. Carlos will let you know of it. This was one of the many tips he made us aware about. While I've read that the park did get a lot of visitors, didn't realized how many until I've arrived. Carlos gave us tips on getting to a hidden beach that locals usually flock to which was nice. Overall this place was 11/10 for me. Carlos and family exceeded my expectations. Muchisimas gracias! The hosts were just wonderful and the breakfast was outstanding. Super-friendly host, with lots of useful tips for first-timers. We enjoyed staying there very much, and had great views of sloths and tucans, which the host pointed out for us. Next time we'll certainly stay there again! This was a super place, on arrival we were met by Carlos and he made us feel very welcome - the property is situated off the main road to Manuel Antonio and as a result mornings and evenings bring forest delights Tucan, Macaw and Monkeys - The accommodation is lovely and clean - we had one of the disabled rooms which had a fabulous bathroom - breakfast was excellent and Carlos was happy to book our trips and offer advise on visiting the National Park. Thank you Carlos for your hospitality in our home from home - we hope to see you again - Pura Vida! We had to use the airconditioning rather than open the window. The owner is great and really helpful. The cleaness of the rooms. 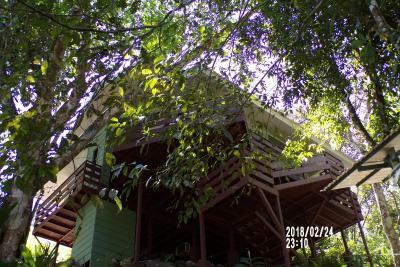 We stayed in the tree house with our family. We loved this home. This is truly an authentic B&B. 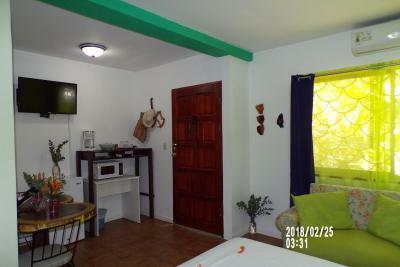 Carlos is a wonderful host that individualizes his recommendations based on his guests interests. 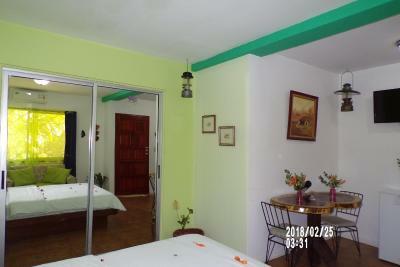 We looked forward to breakfast every morning, the fresh fruit and fruit drinks, and great conversation, so good. 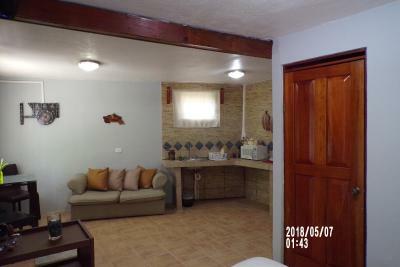 The home is well equipped for cooking and eating in if you wish, very clean. You are in the canopy and can see so many birds, we saw scarlet macaws and toucans, we even saw a kinkajou one night in the tree. 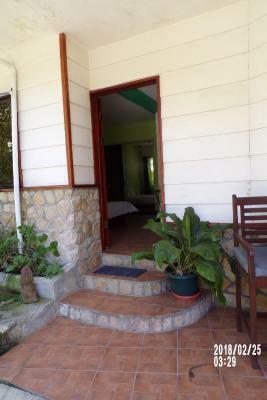 Central location to Manuel Antonio, Quepos, and even Dominical area is not far away. We would certainly stay here again. 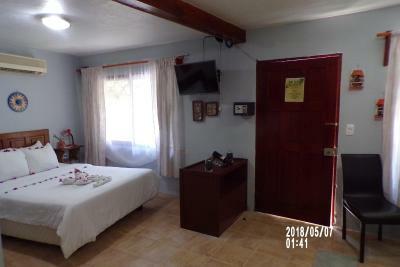 Our room was simple and clean but it was hard to cool it down. Slight noise from neighboring AC unit at night but Carlos was going to fix it.